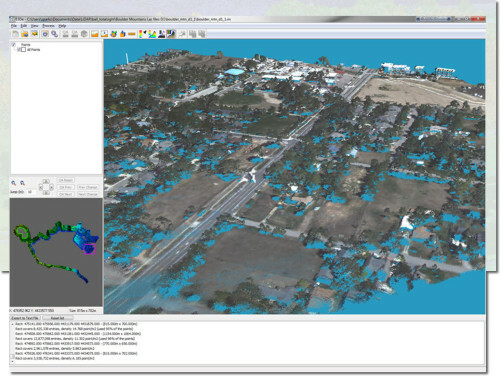 Envi LiDAR is an interactive geospatial software environment that allows you use LiDAR data to create powerful, realistic 3D visualizations and easily extract important features and products from your raw LiDAR point cloud data. When analyzing 3D data, limited file support and data ingest constraints often cause you to spend more time than necessary preparing your data for analysis. With E3De the most commonly used data formats such as LAS, GeoTIFF, and SHP are supported, so you can rapidly access and ingest your LiDAR data. Additionally, E3Decan simultaneously ingest multiple data files, giving you more time to identify features and analyze results. Quickly identify and extract 3D features, refine your results, and export 3D products for further analysis or inclusion in your GIS. Interactive tools to refine your processing parameters and ensure your resulting feature representations are accurate. In Quality Assurance mode, ENVI LiDAR allows you to interactively fine tune point classifications, manipulate elevation values, and modify feature vectors such as building dimensions, tree shapes, and the location of powerpoles and power lines. A 3D Viewer creates a realistic representation of your processed data, and allows you to further qualify the accuracy of your results as you fly through a scene. ENVI LiDAR can simultaneously ingest multiple data files, giving you more time to identify features and analyze results. When analyzing 3D data, limited file support and data ingest constraints often cause you to spend more time than necessary preparing your data for analysis. 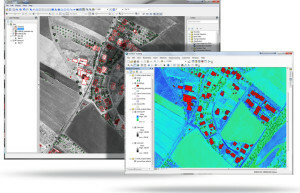 With ENVI LiDAR the most commonly used file formats such as LAS, LAZ, ASCII, NITF LAS, and binary are supported, so you can rapidly access and ingest your LiDAR data. LiDAR is an interactive geospatial environment that can be used to automatically extract topography and features from point clouds. Extract valuable vector information from more than just two dimensional imagery and data. Sharing information with others in a smooth, streamlined process. ENVI LiDAR is interoperable with the tools you already use and can be customized through an API to meet your unique needs. The ENVI Platform, ENVI LiDAR has an API that allows you to customize the application to meet the unique needs of your organization. With the ENVI LiDAR API, you can add your own algorithms, create batch processes, add custom tools, and more. This unique ability means that your software functionality can extend to meet the demands of today and the future. The flexibility of ENVI LiDAR allows you to use results in a variety of geospatial tools like ENVI image analysis software or ArcGIS® from Esri. To perform additional analysis on your exported 3D products, ENVI LiDAR provides an easy to use direct link to automatically open your ENVI LiDAR results within ENVI or ArcGIS. Results from your 3D analysis are easily exported as products or layers that can be used to perform additional geospatial analysis, included in your GIS for mapping applications, or even provided to colleagues as a “project” that can be viewed without a license of E3De. Topographic products and layers generated in E3De can be exported in formats such as a standard raster, a .csv file, or in GeoTIFF, LAS, and SHP file formats. Utilize elevation information from LiDAR data: in a variety of industries from forestry and mining, to defense and intelligence to get the 3D spatial information you need to make decisions. 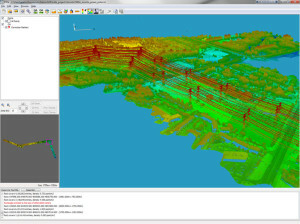 Our technical and training team can help you quickly customize ENVI LiDAR to satisfy your requirements.